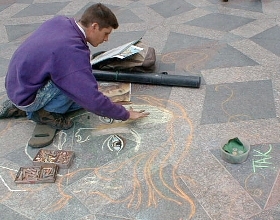 The pedestrian street has since its establishment in 1962 - been a great success. When the volume of traffic increased in the beginning of the 60s - in the inner part of the old narrow streets - and the expanding shopping areas around central Copenhagen - as well as the sidewalks streets became more and more crowded with busy pedestrians - who was bumping into each other and blocking the way on the narrow pavements - Copenhagen’s City Council decided in 1962 - to establish a car free pedestrian zone from the westerly Town Hall Square to Kongens Nytorv (The Kings New Square) in the eastern part of the town called “Strøget” - which also includes a maze of small streets and historical squares - that altogether are fanning out from “Strøget” - and the mediaeval part of Copenhagen - having a total length of almost 3,2 km - and being the oldest and longest pedestrian street system in the world. 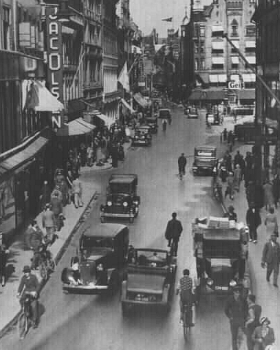 Part of the former pedestrian street in 1935, near Østergade and Amagertorv - where the traffic started to increase with different types of motorised vehicles. The longest coffee table in the world stretched from the one end of the pedestrian street to the other in connection with Copenhagen's 800 year jubilee in 1967. 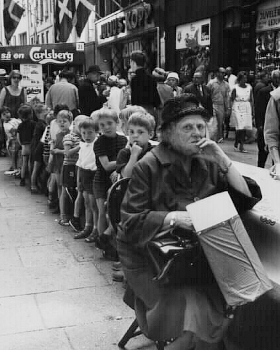 Copenhagen City Council decided at a council meeting on October - 1962 - that “Frederiksberggade” - which begging’s at the Town Hall Square - and to “Kongens Nytorv” (The King’s Square) - should be tested in a period - as a new "Pedestrian Street" - from the 17 November - 1962. And after a successful 2-year trial period - with much cleaner air - and no traffic - plus many happy pedestrians - the city council decided to transform the tested zone into a permanent “Pedestrian Street” in February - 1964. 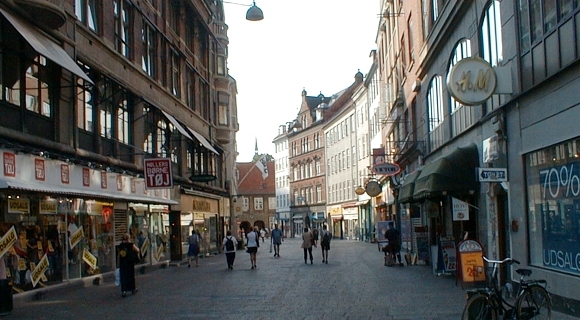 The new “Pedestrian Street” was the first - and since been the longest in the world - called “Strøget”. The auto-free zone in Copenhagen is a great tourist attraction - which includes the longest pedestrian street in the world (Strøget) - and offers plentiful of restaurants - outdoor sidewalk cafes - fast food - specialty shops - art galleries - gift stores - department stores - street entertainment - theatres - museums and much more. Day and night there's always something to see and do on "Strøget" - and visitors are always surrounded by fresh air - as well as noiseless environment all year round - but constantly in a hectic shopping atmosphere - and just an oasis for genuine shopaholics. On the west side entrance of “Strøget” you will find the Lure Blowers - Town Hall - Tivoli - Glyptotek - Vesterbrogade plus Major Cinemas - and at the opposite east end of the car-free strip of “Strøget” - all the shops with the established international brands are located beside Kongens Nytorv - Nyhavn and the Royal Theatre. 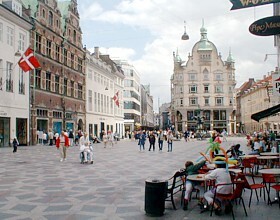 The pedestrian street in central Copenhagen is almost 3,2 km long - with all squares and additional streets included. There is a great extent of outdoor entertainment - and activities all day long and during late evening hours too at "Strøget". In 1967 - Copenhagen celebrated the city's 800 year jubilee - and used the Pedestrian and Shopping street “Strøget" to create the world’s longest coffee table - by serving more than 800,000 cups of coffee - as well as 100,000 of the famous Town Hall pancakes - which are traditionally served on special occasions to official guests that visits the Town Hall. The Pedestrian and Shopping Street “Strøget” was a great success from the very beginning - and have since survived for 50 years - and at the same time been a admired model and source of inspiration to hundreds of capitals and major cities around the world. The Pedestrian Street - "Strøget" - can celebrate it's 50-year jubilee on 17 November - 2012. Every noon the Royal Guard will march to Amalienborg Palace through “Strøget” - when the Royal family is in residence in Copenhagen. This tradition began in 1794 - when Amalienborg Palace became the prime royal residence. Many Cafes - bistros and cozy restaurants are located around the pedestrian area - as well as the mediaeval part of the inner city - offering a broad selection of national and international menus - plus seasonal specialities. 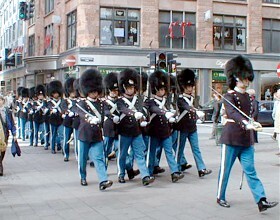 Every noon the Royal Guard - will march from Rosenborg Castle through the Pedestrian Street “Strøget” - to Amalienborg Palace. When the Royal family is in residence at Amalienborg Palace - the Royals Guards will be followed by an accompanying music band. 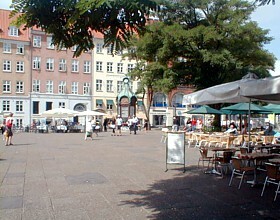 The pedestrian street starts at the Town Hall Square and ends at Kongens Nytorv - or visa versa. Location of the strip "Strøget"
The pedestrian strip "Strøget" begins at Frederiksberggade at the Town Hall Square and passes over Nytorv (New Square) and Gammeltorv (Old Square) - then runs through Nygade (the shortest street in the city) to Vimmelskaftet - then flows out of Amagertorv and Østergade - where it ends at Kongens Nytorv (The Kings Square). At Amagertorv the pedestrian street continues by Købmagergade through Kultorvet (Coal Square) right up to Nørrevoldgade and Nørreport Station.